LOUISVILLE – “How should the church respond when sin disrupts the church’s unity, creates division among the children of God, and constructs unjust systems that steal life from God’s creation?” This question begins the introduction of the Belhar Confession in the PC(USA)’s Book of Confessions. Put another way, the question could be: How are these same issues manifested in the way we, as a church body, conduct our national gatherings? Such questions have inspired a new approach to national gatherings. Rather than sweeping into meeting rooms and convention centers and leaving without a trace, Big Tent this July is organized to ensure that participants engage as much with the St. Louis community as they do with each other. The Office of the General Assembly’s new Hands and Feet initiative is designed to enable all the participants in national gatherings like Big Tent and General Assembly to listen to and learn from the communities they visit and even participate in projects with community members. The initiative was introduced at the 2017 Montreat College Conference, where the General Assembly Stated Clerk, the Rev. Dr. J. Herbert Nelson, II, laid out his vision. “Beginning in St. Louis, we are starting something we call Hands and Feet. We are going in with our hands, we are going in with our feet, to have teach-ins. We’re going in with hands and feet to do some work,” Nelson said. Hands and Feet ensures that PC(USA) gatherings don’t merely provide an economic boost to the city, but that Presbyterians also leave a tangible legacy long after the events have ended. Big Tent 2017 will focus on the theme of “Race, Reconciliation, and the Reformation,” emphasizing the need for a critical analysis of those issues. The theme will be reflected in the workshops offered, as well as in the worship services and Bible studies. Race will take center stage at the Friday night activity as attendees engage with churches and residents in the city, which has dealt with racial issues firsthand. St. Louis was where the infamous Dred Scott Supreme Court decision began. In 1846 lawyers representing Scott, a slave, filed a lawsuit in St. Louis in an effort to gain his freedom, but in 1857 the U.S. Supreme Court ruled against him. Just three years ago, racial tension rocked the St. Louis area after a white police officer shot and killed a black 18-year-old, Michael Brown, in the suburb of Ferguson. Racial divisions in the city are perhaps nowhere more evident than along Delmar Boulevard, nicknamed the Delmar Divide. In the neighborhood just north of the Divide, 99 percent of the residents are black. In the neighborhood just south of the Divide, the population is 70 percent white. “From the beginning, we knew that we wanted to embrace St. Louis’ recent history of racial conflict as a place for confronting the deep issues of race and privilege in the church and society. But we didn’t want this to be a drive-by tourist experience. The Holy Conversations activity allows for a focused, experiential opportunity to partner with the congregations of St. Louis,” said Tom Hay, director of operations for the Office of the General Assembly. 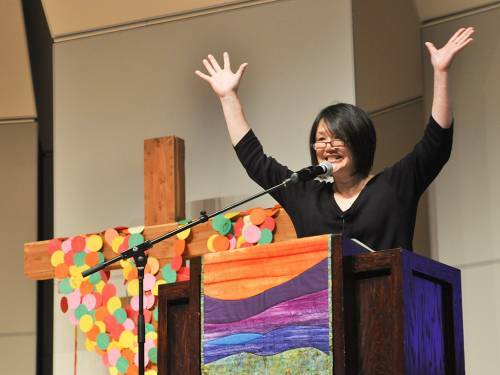 The “Holy Conversations around race” will take place on the Friday night of Big Tent, when participants will worship with and share a meal with members of five St. Louis congregations. Four of the five churches are located near the Delmar Divide. The Rev. Clyde R. Crumpton, pastor of Cote Brilliante Presbyterian Church in St. Louis, said the Holy Conversations are important. “It will give us an opportunity to share our thoughts and experiences on some of the things that have taken place in St. Louis, especially since Michael Brown in Ferguson, which is right near where we are in St. Louis,” he said. Big Tent is not going to solve the existing racial divisions in St. Louis. It isn’t meant to. Yet by living into the Confession of Belhar, it is laying the path for reconciliation. 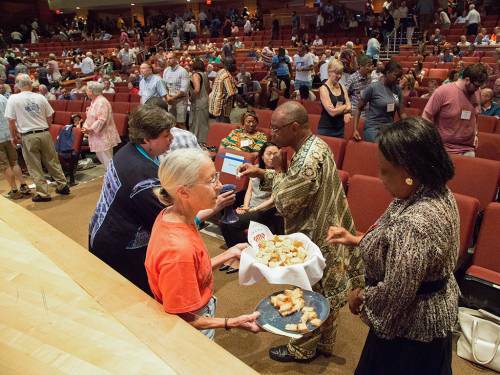 The Hands and Feet initiative and the new approach to national gatherings reflect how the PC(USA) is putting the newly adopted confession into practice as it seeks to heal divisions, dismantle unjust systems and point to new life in God’s creation. Mari Graham is the social media strategist for the Presbyterian Mission Agency.